A baby that cries nonstop is nothing to take lightly. It’s scary enough being a new parent, so when you add in the nonstop crying, it elevates the stress. Usually there is a reason for the tears and after parents go through the steps to figure it out, there is a good chance that the end result is gas, hunger or fatigue. After experience, some parents learn what works and what doesn’t work and they may even create their own unique methods to calming a baby. Oftentimes a baby will rest quietly in the nook of a father’s arms as he is swung back and forth. And other times, a good bounce on one of those stability balls tends to do the trick. In any event, a lot of parents take pride in what works for them and have a tendency to share their little tidbits of advice with friends and family. When Scott and Jessica Walker were faced with their own crying infant daughter, they took all the usual steps, but nothing seemed to work. They tried rocking, swinging and even soaked the baby in water because they thought that she might be too hot. Then, finally, when they took off their daughter’s socks, their questions were answered. While the problem appeared to be tiny, it was anything but. A single hair had managed to catch on one of her toes. It was wrapped so tightly that it was slicing through her skin and cutting off the circulation. Her mother, who was a nurse, moved quickly when she saw the wrapped toe. She instantly grabbed a pair of tweezers and went to work removing the hair. Luckily she got it off in time. Known as hair tourniquet, this situation is fairly common with infants, as it’s easy for a hair to wrap around an infant’s tiny extremities. A hair can become spontaneously tied around a toe and as the baby moves and wiggles, the hair tightens, thus cutting off the circulation. It’s more likely that this will occur with a natural hair from the head, rather than a piece of thread. These incidents also commonly occur when a baby or child sleeps. As they are tucked under sheets or duvets, the loose blanket threads can constrict the toes. While most infants aren’t tucked into blankets, they are more likely to face this issue simply by wearing socks. Scott and Jessica wanted to share their story so that other parents can be aware, in the event that their child is crying and inconsolable. 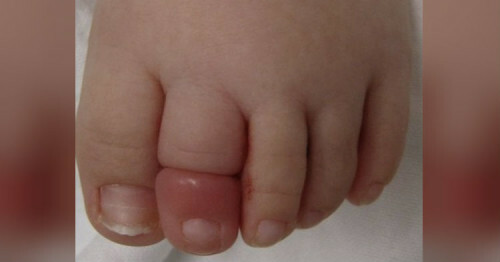 They urge parents to always check the baby’s toes or fingers if they are crying and aren’t struggling with the usual symptoms. So, after you go through the routine of swinging, bouncing, bathing and feeding your babe, be sure to remove the socks and check those cute little toes. That is a lot of pain to endure for a tiny little baby and if it goes unnoticed for long enough, then it could lead to something worse.